“SKEL” is the alias for Artist Jason Skeldon, originally from Las Vegas. The artist has resided most of his life in Tampa,Fl. Jason has work hanging all over the united states including Los Angeles,New York,Miami etc. 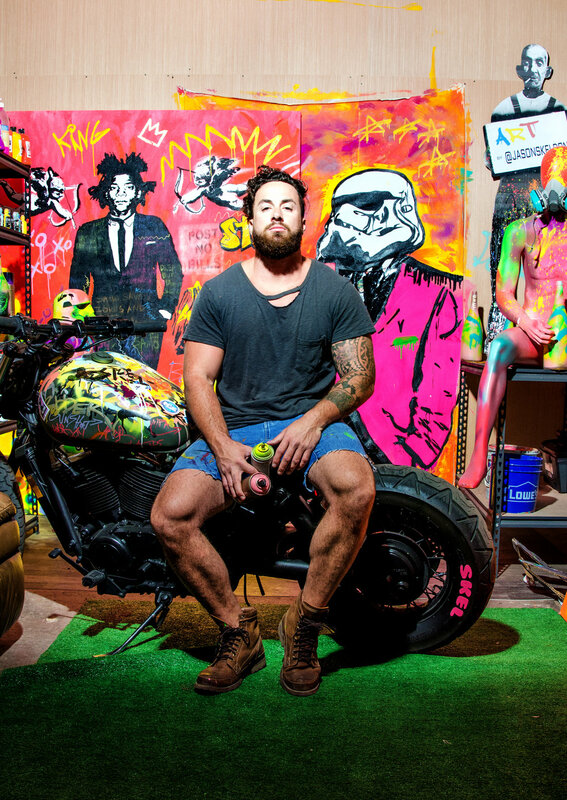 His art style is influenced by pop culture and current events used with spray paints , acrylic and water colors, stencils and resins. Jason’s work can be seen in his gallery at opes health , international mall, mesu art gallery St.Pete,Fl, Aloft Hotel orlando,Fl, 1826 Bar and Lounge south beach Miami and many more. Some notable clients are Kevin Hart(comedian),Taylor Swift(singer), Akon(singer),Rashad Evans(mma), Hulk Hogan, Phil Heath, Ian Somerhalder(vampire diaries),Wade boggs(Baseball),Jameis Winston(football). Jason, never went to art school and created his own style of art through trial and error with multiple mediums. Influencers are Banksy(artist), Walt Disney, and Warren Buffet.